One can't help but be sympathetic to American Muslims in the post-9/11 era. Their patriotism has been questioned and they are simultaneously pulled in opposite directions by the fundamentalists and reformers in Islam. Though secure in their faith, many are beginning to question some of the assumptions that their communities have accepted and promoted, triggering what may be the beginning of an Islamic reformation. It is not surprising, therefore, that many Muslims in the United States are confused about their place in the world. Ali Eteraz, noted blogger and lawyer, was certainly one of those Muslims. As he relates in Children of Dust: A memoir of Pakistan, he was born in Pakistan but was raised for much of his life in the United States. Told from an early age that he would play a prominent role in the Islamic world, his given name of Abir ul Islam translates into "Perfume of Islam", Eteraz has suffered through a crisis of faith, fundamentalism and finally becoming a proponent for reform. Coming from a traditional culture like Pakistan has meant that he has also had to fight outsized battles against temptation, and not always successfully. Eteraz's story begins in rural Pakistan where he attended a madrassa to memorize the Koran. Motivated by a pledge his father made in Mecca promising his first born son to Islam, Eteraz suffers through harsh beatings for the slightest error. He is surrounded by a loving family but dim economic prospects see his family immigrate to Alabama where he faces increasingly isolated. Working to become a pious Muslim in reaction to what he sees as a licentious America, he eventually drifts toward a more fundamentalist understanding of his faith. Soon he is active in student organizations and organizes protests and conferences to attract other young American Muslims. His fundamentalism, however, masks an increasing disenchantment both with himself and how he views Islam. A trip back to Pakistan nearly sees him killed by militants who believe that he is nothing more than an American agent. Though remaining active and portraying himself as a fundamentalist, Eteraz is secretly drawn to Western philosophers and a desire to know people on a level deeper than religion. Personal and world events cause Eteraz to very nearly leave Islam before he rediscovers what he initially loved about the faith in the first place, that its rich tradition gave him an identity to be proud of. Children of Dust is a coming of age story, filled with warmth and humour, but it also explores some very serious questions that Muslims, both in the United States and elsewhere, are undoubtedly asking themselves. Islam is a traditional faith that demands its adherents place Allah above all else – a difficult feat when your nation also asks the same of you, something that Muslims in every nation on Earth have been grappling with for centuries. There is also the war between moderates who believe Islam is a deeply personal spiritual mission versus the fundamentalists who believe it is a weapon to be used to transform the world into some Wahhabist day dream. There is one curious choice that Eteraz made and that is to virtually avoid any mention of the events of September 11, 2001. 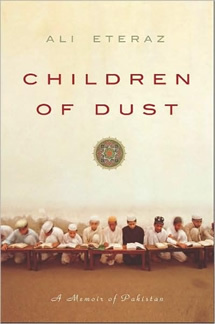 Granted one could argue that requiring every Muslim writer to extensively address the attacks reinforces the association of Islam with terrorism but the point of Children of Dust was to chronicle a young Muslim's struggle with his faith and how that was shaped by events and the people around him. The nature of his faith was constantly deflected into new directions and Eteraz does remark that 9/11 was among the most profound of those events. It's hardly a fatal flaw but one wonders why Eteraz didn't devote more time to the ramifications of that day to both himself and those of his faith. Despite that, Children of Dust is a powerful and marvellous personal memoir. Although many in the West view Muslims and their religion to an unknowable alien force in the world, Eteraz underlines the obvious truth that there are more similarities among the peoples of the world than differences. We all face the same challenges of trying to find ourselves in the world, attempting the balance the demands we place on ourselves with those from surround us. Children of Dust is the story of a young Muslim attempting to come to terms with his faith, but it's also a story that most of us could have written at one point in our lives.